Skinspirations, a cosmetic surgery and regenerative practice in Clearwater, Florida, provides the most effective, cosmetic medical treatments and skin care available. Dr. Cynthia Elliott is a physician instructor of dermal filler techniques and laser treatments, Corinn Singletary, PA-C, and Dr Stacy Chase provide training in aesthetic injectables and together with the rest of our staff, we’ve performed over 67,000 cosmetic medical treatments. At Skinspirations, you can rest assured that you’ll get the quality of results that other practitioners are still trying to learn. 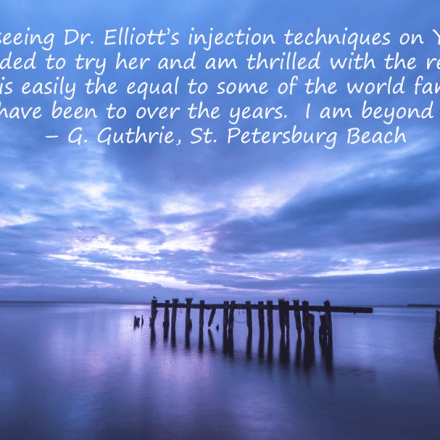 Read our reviews and you’ll see that we have a reputation for the best cosmetic medical results in Tampa Bay and with no sales pressure. And because Skinspirations is a medical practice and not a spa, we provide treatments that can produce dramatic results safely. Come in for a complimentary consultation and we’ll be happy to give you our recommendations on the treatments and/or products that will give you your most flattering look. Your convenience is our priority. With practitioners and aestheticians available Mondays through Saturdays, including evenings, you can reach your appearance goals sometimes the same day.